The Original Smokeeter is the first and best commercial indoor air cleaner of its kind. With Electrostatic Precipitator (ESP) technology, Smokeeter, smoke eaters remove contaminants like dust, pollen, bacteria, fungi, smoke, and viruses far better than competitors. Within Smokeeters complete line of products, there is a smoke eater model designed to accommodate your specific application and room size. All Smokeeter air cleaners are self-contained, two-stage electrostatic precipitators that can be easily mounted on walls or installed and concealed above ceilings. If you'd a recommendation for a model based on the configuration and size of your establishment, get in touch by calling (866) 651-9761. How Do Smoke Eaters work? Hazardous particles are drawn into the Smokeeter unit. The Ionizer electrostatically charges the particles. The Collection Cell captures charged particles. The Pre-Filter captures larger airborne particles as they enter the unit. The activated carbon After-Filter helps control odors. The clean, fresh air is then re-circulated back into the room. The Indicator Light illuminates when the unit is working properly and shuts off when components need routine servicing. The Multi-Speed Control Switch provides variable blower speed adjustments to control noise levels during peak and off-peak business hours. 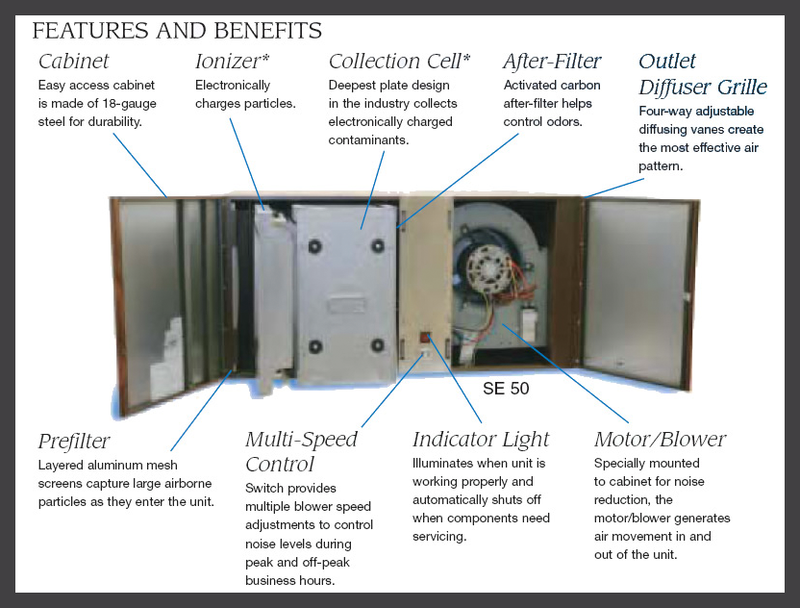 Some Smokeeters use a unicell, which is an ionizer and collection cell assembled in one unit. SE 40 450-950 CFM 800-1200 Sq. Ft. SE 50 590-1,500 CFM 1,500-2,200 Sq. Ft. SE 24 350-1020 CFM 600-1,500 Sq. Ft.
CC / DC 1,200 - 2,200 CFM 800-2200 Sq. Ft.
FS 480-885 CFM 800-1200 Sq Ft.
LS 590-1600 CFM 1500-2200 Sq. Ft.
Did you know that indoor air quality (IAQ) is worse than most of us realize? Indoor concentrations of pollutants range from 2 to 100 times greater than outdoor concentrations. These circumstances can cause SBS (Sick Building Syndrome) which may result in headaches, sinus congestion, fatigue, nausea, dizziness, eye irritation, cough and sore throat. 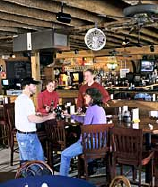 Restaurants, bars, health care facilities and many other public places depend on smoke eaters to provide a safe environment for both employees and patrons. Generally, air cleaning systems are running continuously, which is why Smokeeters are built-to-last even when handling the most demanding applications. Aside from guaranteeing cleaner air for your guests and staff, Smokeeters lower utility bills. Smoke eaters can be easily mounted on walls or installed and concealed above ceilings. Because Smokeeters use easy-to-clean, reusable aluminum collection cell components, you don't have to worry about replacing the filter frequently. Smokeeters have twice as much collection surface area as other ESP air cleaners, allowing for less maintenance and clean up. Smokeeters use less energy and are 35% more effective in capturing submicronic particles than media units. Smokeeters operate on a low horsepower reducing noise from the motor and blower.